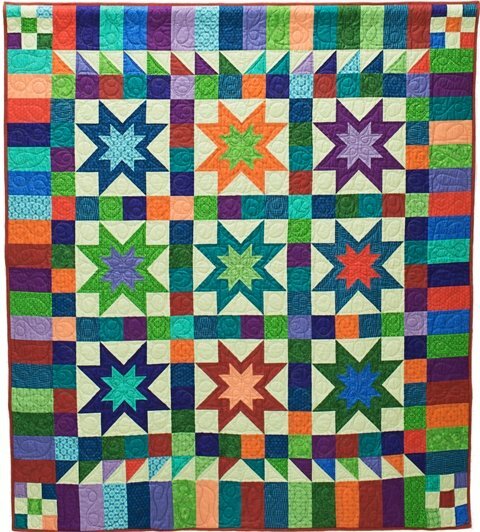 Nine Stars Rising was a mystery quilt in our 2014-2015 Scrap Tamers Club. It is made of “darks”, “mediums” and one background. The darks and mediums use different yardage amounts and are cut differently. They are sometimes used in different places and sometimes mixed together. You will be pairing each dark print with a medium print when making the 9 stars, so will need some difference in value or color. It will be more important that you can pair prints together than that they are really darks and mediums. We have also included instructions for cutting the dark and medium prints from your stash.